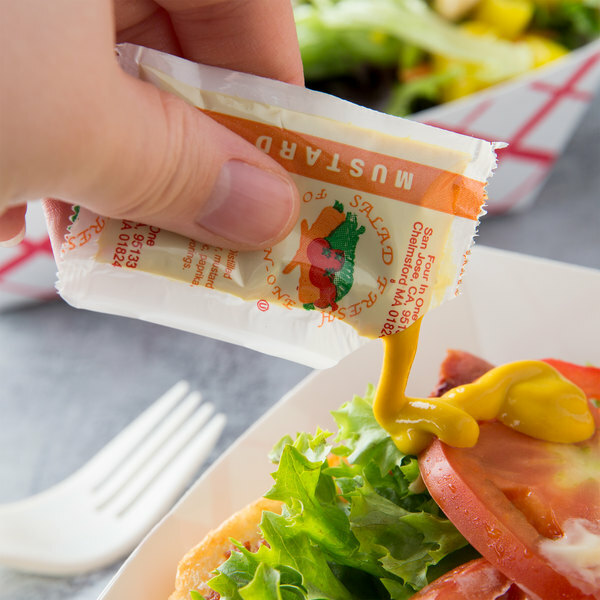 Whether your customers are dining in or grabbing takeout, you'll be able to complete any meal with this yellow mustard! Rich and tangy, this mustard portion control packet will add just the right amount of flavor to your customers' hot dogs, hamburgers, and soft pretzels. These 5.5 gram packets are ideal for any restaurant, diner, convenience store, grocery store, school cafeteria, or takeout station. Make sure to always have mustard on hand for your sandwiches, subs, and wraps. With its classic recipe and smooth texture, mustard features the perfect blend of flavorful ingredients, making for a savory sauce that will enhance the flavor of almost any dish! Made using mustard seeds, turmeric, vinegar, and other natural ingredients, this delicious mustard will delight your customers with the traditional taste they know and love. 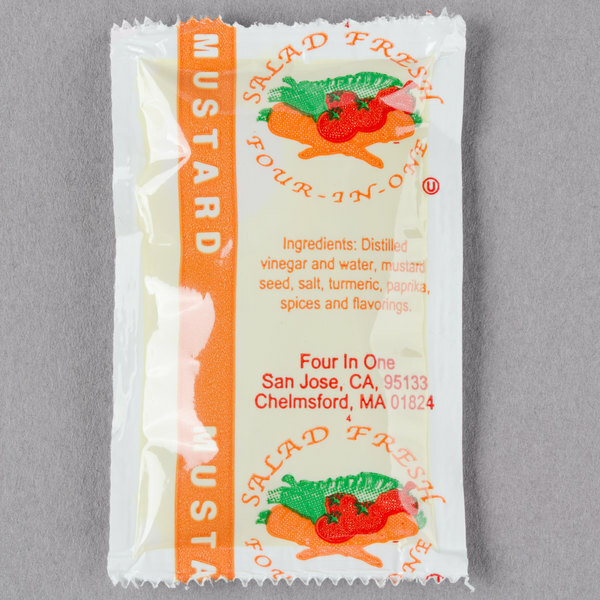 These disposable 5.5 gram portion control mustard packets make for a tasty and convenient addition to your menu. A must have and money saver for to go orders! And for that price? This is one product that will be on a regular order for me! 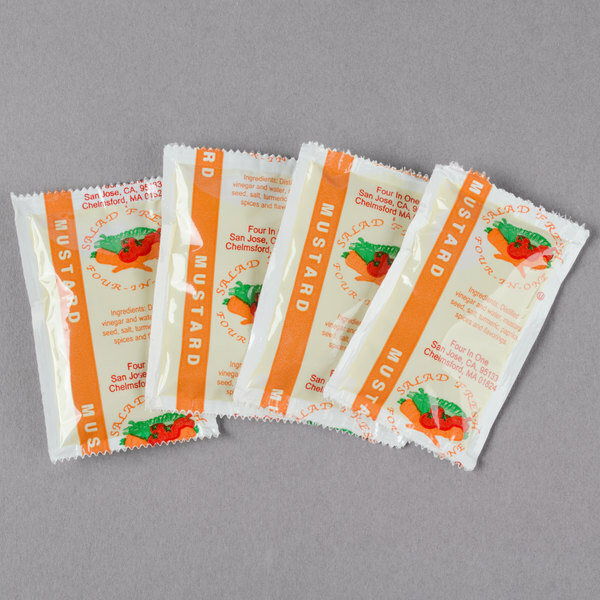 These packets are perfect for any quick serve restaurant. They are great for to go orders and even dine in orders. Not messy, packaging is easy to open. This is a great tasting mustard at a fantastic price! The packet is the perfect size for hot dogs and they save on waste. I would purchase these again. THESE ARE GREAT LITTLE PACKS OF MUSTARD AT A GOOD PRICE. PERFECT TO PUT IN WITH FUNDRAISER SANDWICHES, OR TO KEEP ON HAND FOR CARRYOUT ORDERS. Great size for a sandwich or corn dog. The taste is great and the packets are sturdy and never leak. Great to put into bags with to go orders. As an inexpensive alternative to a popular brand, this mustard is actually pretty good. We use these packets for outdoor events when people generally don’t care if they are getting brand-name products. The yellow mustard 5.5 gram portion packets of mustard a great value. The perfect way to top hot dogs and hamburgers and great packaging for our concession stand. 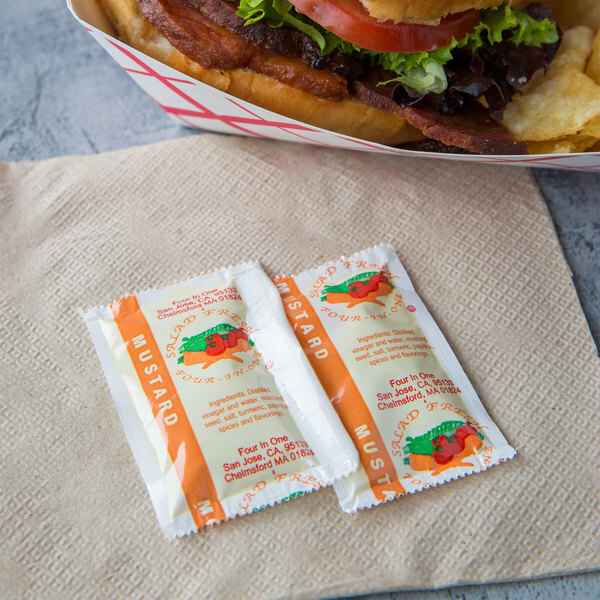 We used these mustard packets at a lunch we did for a large group in an outdoor setting. They held up well and we had no complaints. Would use again. This may be the generic version, but do not let that turn you away at all. This stuff is just as good as the name brand mustard I promise you that. A nice value mustard with a really great taste. I was highly pleased with this product and it works great for our deli. I will definitely be purchasing again. Great mustard packet for the price. Customers seem to like it. We use a lot with burgers and sandwiches. We definitely this recommend to others. The yellow mustard is tangy and a tad spicy making it a great addition to sub sandwiches. The portion packets make it easy o take in my lunch. This is a great tasting mustard at a great price. I have never had a complaint about this particular product, just compliments about the taste. This is a good quality mustard. It tastes great and it's very affordable. They're great for corn dogs, hot dogs, and hamburgers. I've even known people who eat it with their fries. We do a lot of bagged lunches and this is a cost effective way for us to have better, longer lasting sandwiches. The flavor is comparable to name brands. Is there such thing as a 'mustard connoisseur? I don't think so. But in any case yellow mustard is yellow mustard - nothing gourmet or 'fancy' about it but just the same...I LOVE yellow mustard personally. And in a blind taste-test who could "really" tell the difference between one brand or another - and who would claim to be able to do that in the first place - it's just mustard?! LOL. We went with this brand of mustard because the cost savings and I love it just the same. We sell the large bread-like pretzels so mustard is one of the condiments that we offer our customers to go with them. This mustard tastes good and is right for the price! This is better than most name brands in the store. I have been using this lately instead and do not think I will go back. It is cheaper too! Delicious mustard, great portion sizes, our customers love them with a hot salted pretzel. Wish I could have ordered a smaller box though I think this will take a while to go through. 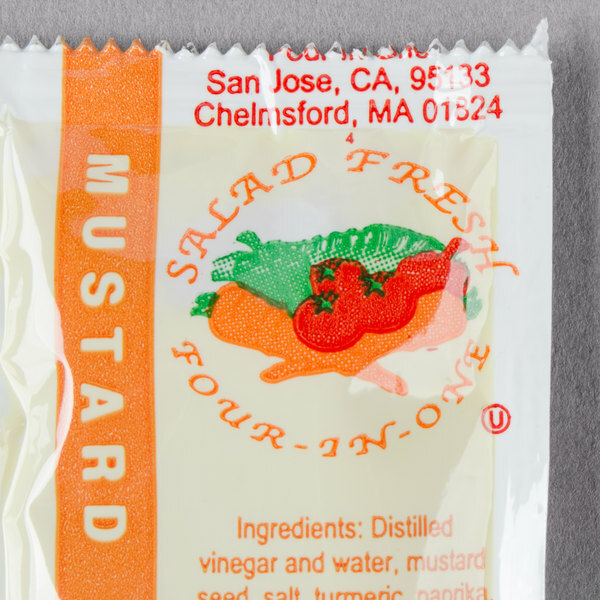 Very good mustard packets, we use these on our catering picnic buffets and they are just as good as the name brand mustard but the cost for us is better. I ordered these for our lake house that we rent out. I love them, the prices are the best I have found online and shipping was fast. This tastes like any other mustard you use for burgers and hot dogs. The 5.5 gram portion is also good enough since this is not used as much as ketchup. Great product at a wonderful price point. When doing take out, a lot of times condiments are a throw away expense. This product makes that expense a lot less. These mustard packets are the best both in taste and convenience. A perfect way for me to provide my customers with condiments for their sandwiches. 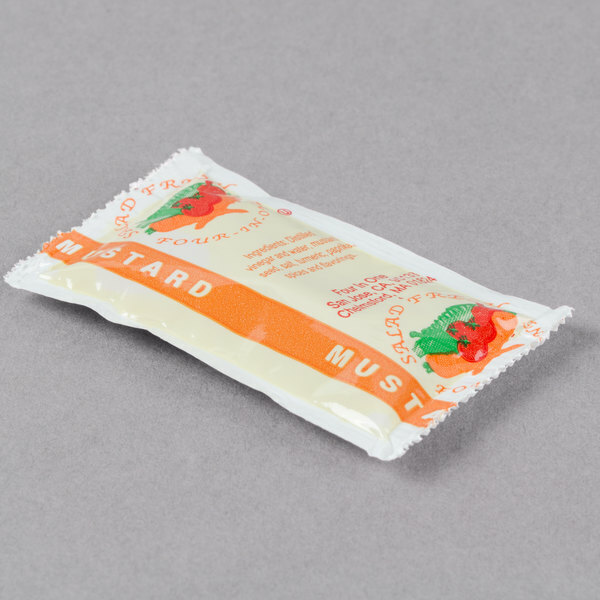 I am very pleased with the quality of these mustard packets. They have just enough in the packet to provide the customer with what they need. Great tasting sharp mustard nice and thick. Great mustard at a nice price. We will continue using it as long as it's available. I can recommend this and nitpick brand in general we have switched to several of their flavors from pricey brands. We prefer Piknik mustard from the Webstaurantstore simply because it's more cost effective than from our vendors. It is a 5.5 gram packet which is a bit small. Neat design on the packet. These mustard packets are manufactured by admiration. Great price, my only complaint/recommandation is that They Should make The packets at least 7 grams. 5.5 is on the low side and we have to include two with every take out. Great product at a great price. Much neater looking when you can hand someone a packet rather than a bottle that everyone has touched each time it's used. Great product at a great price. We use them along side our wraps. Saves us time and money from putting extra sauces in plastic containers.